In its on-going rollout of Wild Appalachia, Fallout 76 brings update 8.5 to players, which features the ProSnap Deluxe Camera, basic and improved repair kits, and balances to aluminum. Besides those, the developers worked on fixing bugs like the infinite loading screen some players encountered and UI features working incorrectly. Camelot Unchained backers over the weekend had the opportunity to kick the crap out of the servers for a planned stress test, and apparently it stressed more than just the servers, to the point that City State Entertainment even warned people to log out if their machines were melting. Ahh, MMOs. Last month, Albion Online dev Sandbox Interactive announced that it is working on a massive overhaul of the game’s Outlands map, which will substantially increase the size of the world, but with the influx of new players following the game’s recent transition to free-to-play, a more timely expansion seems to be in order. To that end, the devs have announced the imminent release of an expansion based on the current map layout that will add three new regions to the Outlands. Albion Online is getting in to the spring spirit with the usual Easter-themed shenanigans, but that’s not the only thing that’s happening in the latest patch. Players are also getting a significant bump to Silver shrine buffs and a return to form for guild change timers. The Iron Lion is a fairly new order, one formed out of a desire to control the unknowable. With the rediscovery of the old world, many Kaelar wondered what lay beyond, considering the incredible power the divine gateways represented. To this end, the Iron Lion focuses not only on martial combat, but also on the art of dampening magic. Without such knowledge, establishing a foothold may be all but impossible – rampant magic is an unpredictable, and many times lethal, complication in any sortie. 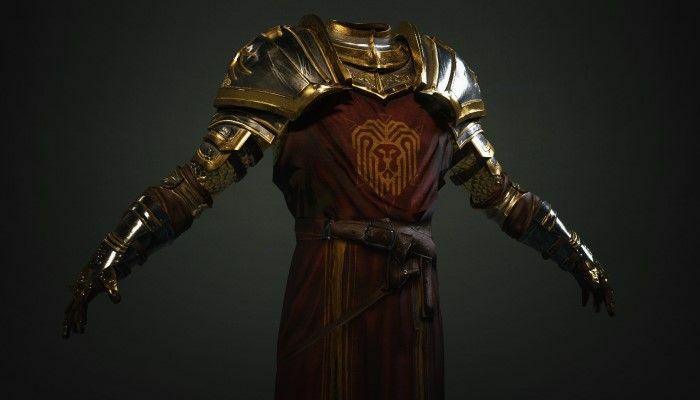 Due to this, the Iron Lion puts forth significant effort in studying and learning about the magics they come across, hoping to minimize the dangers they pose.